A dental crown is a long-lasting, natural-looking way to preserve a tooth. Our goal is always to provide you with the most natural looking smile possible. When a tooth cannot be restored with a filling, a crown is an excellent option. A lot of people have reservations about dental crowns, perhaps referring to a friend’s dental work where they can see a black line near the gums. Years ago, dental materials were limited and often porcelain fused to a gold crown was the only option. Many breakthroughs in dental materials have occurred and EMA Dental continues to stay up to date as our materials evolve. Now there are stunning all-ceramic crowns, no gold, and no black line. These crowns will look and feel like they have been in your mouth your entire life, and they will be absolutely undetectable. 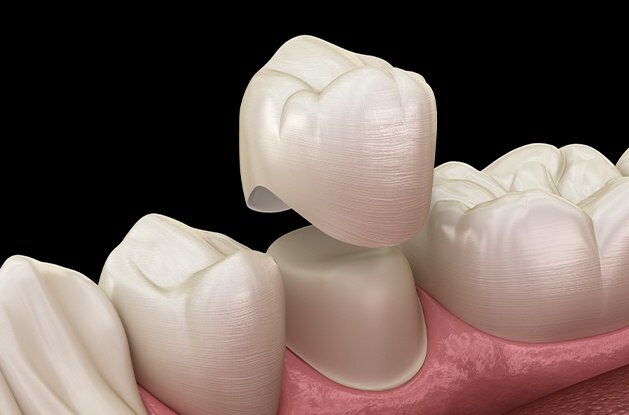 Preparing a tooth for a crown is a two-part procedure. Often, for one single tooth, the first appointment will require an hour. Your doctor will anesthetize the area and then remove any existing filling material or any decay that may be present. Once the tooth is cleaned, your doctor will bond into place a core build up. The buildup is a very hard, light cured material that provides a solid substructure for the base of a crown. The entire periphery of the tooth and the core build-up is then prepared. Typically, there will be three impressions taken throughout the hour procedure, and there will also be breaks in between for the patient. Once the preparation is finished, you will have a temporary crown placed. The temporary crown consists of an acrylic, plastic material and is very durable. The second appointment will be 3-4 weeks later, and for a single tooth, will require a half hour. Often, patients will not require anesthetic for this visit. The temporary crown is removed and the new permanent crown will be placed and adjusted if necessary. You and your doctor will discuss aesthetics and feel of the new crown, and if both are satisfied, the crown will be cemented with permanent cement. First, a crown will restore function, strength, and health to a previously compromised tooth. A crown gives you the chance to save your underlying tooth structure when fracture or decay occurs. Your new crown should last anywhere between 7-10 years or longer; the life expectancy of a crown varies between individuals and is largely based on how people care for their mouth in general. Because a crown is all one material and made to be completely lifelike, a tooth’s aesthetics are always improved. Preparing a tooth for a crown is considered an irreversible procedure, meaning that enamel is cut away in order to make room for a crown to cover over the existing tooth structure. There is usually minimal discomfort following a crown preparation, especially in the areas of the injection site and around the tissue of the tooth that has been worked on. A clinical oral examination, dental radiographs, and a conversation with your doctor will determine if you are a good candidate for this procedure. There are statistics that suggest 15 million people in the U.S. alone have had some type of crown or bridge replacement to save compromised teeth. There is no recovery time after preparing a tooth for a crown. However, we do ask that you do not try to chew anything until your Novocain has completely worn off. There is a risk of tissue or tongue injury when you are still feeling the effects of anesthetic. A crown procedure will require two trips to the dental office. The first appointment is usually the longer one and can vary depending on how many teeth are being prepared for treatment. After the appropriate consult with your doctor, a treatment plan will be reviewed covering the cost of the procedure, and again, this can vary based on quantity and complexity of an individual patient’s needs. You will have the opportunity to speak with an administrative insurance specialist regarding your specific coverage, however, this procedure is typically covered by most dental insurance plans.